Greenington's mission is to provide consumers with only the finest in bamboo home furniture. We strive to ensure that our products represent quality, style, and elegance. That's why we use only the best materials and craftsmen, ensuring we provide consistent quality and the best service. Click here to view a brief video of how we make furniture. Why Bamboo? Bamboo is one of the fastest growing plants, reaching maturity in 5 years or less. Bamboo is also one of the best plants to sequester carbon, and releases about 35% more oxygen than equivalent stands of trees. Each bamboo culm used in the production of Greenington products is individually selected by the local farmer working and tending the land. Harvest is done by hand. This preserves the balance of the native bamboo forest, and leaves the bamboo root system intact. From this root system new bamboo shoots will emerge, and new bamboo culms will develop. Greenington does not use clear cutting methods which are commonly in practice in the wood lumber industry. Our factory utilizes the entire bamboo culm in the manufacturing process, wasting nothing. 100% of the bamboo material is used, including the sawdust, which is put to use generating steam for the dry kiln room and press machine. Furthermore, Greenington follows international standard guidelines according to ISO 14001 Environmental Management. Following international standard guidelines, the Greenington factory carefully selects materials we use, and ensure that all products are tested to meet or exceed the most stringent manufacturing standards. The Currant Tall Chest of Drawers, part of the Currant Bedroom Set by Greenington Fine Bamboo Furniture. Shown in a warm and inviting caramelized finish. The Currant Bedroom Collection was inspired by Scandinavian modernism. Simple lines bring the elegance of Mid-Century design into the modern home. 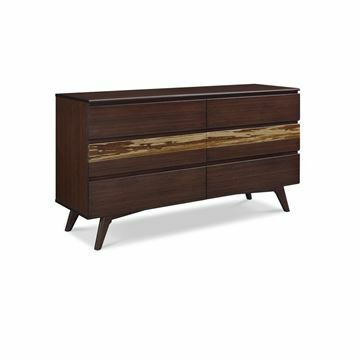 The Currant high chest features sleek recessed drawer pulls, under mount hardware and soft closing drawers. The Currant Bed by Greenington Fine Bamboo Furniture. Shown in a warm and inviting caramelized finish. The Currant Bedroom Collection was inspired by Scandinavian modernism. Simple lines bring the elegance of Mid-Century design into the modern home. The Currant’s uniquely shaped headboard showcase the beautiful color and grain of solid bamboo. The sleek wrap around side rails and footboard finish the look with handsomely shaped legs which taper towards the floor. The Currant Bedroom Set by Greenington Fine Bamboo Furniture. Shown in a warm and inviting caramelized finish. The Currant Bedroom Collection was inspired by Scandinavian modernism. Simple lines bring the elegance of Mid-Century design into the modern home. The Currant’s uniquely shaped headboard showcase the beautiful color and grain of solid bamboo. The sleek wrap around side rails and footboard finish the look with handsomely shaped legs which taper towards the floor. The Currant Tall Chest of Drawers, part of the Currant Bedroom Set by Greenington Fine Bamboo Furniture. Shown in a deep and rich black walnut finish. The Currant Bedroom Collection was inspired by Scandinavian modernism. Simple lines bring the elegance of Mid-Century design into the modern home. The Currant Bedroom Set by Greenington Fine Bamboo Furniture. Shown in a deep and rich black walnut finish. The Currant Bedroom Collection was inspired by Scandinavian modernism. Simple lines bring the elegance of Mid-Century design into the modern home. The Currant’s uniquely shaped headboard showcase the beautiful color and grain of solid bamboo. The sleek wrap around side rails and footboard finish the look with handsomely shaped legs which taper towards the floor. The Azara Sideboard Buffet, part of the Azara Dining Set in Sable finish, by Greenington. Each piece is crafted in solid bamboo. 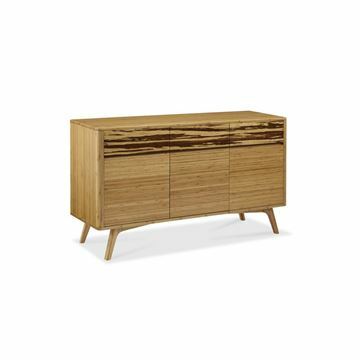 A sleek mid-century design with modern architectural lines, great legs, and an accent of exotic tiger bamboo. Beautifully finished on all four sides, the Azara sideboard features include angled tapered legs, solid bamboo drawer boxes with English dovetail, recessed drawer pulls, under mount drawer glides, and soft closing doors and drawers. Inside, the three doors open to expose generous storage shelves, while above the three coordinating drawers are each faced in solid exotic Tiger bamboo. The Azara Sizeboard Buffet in Caramelized finish, part of the Azara Dining Set by Greenington. Each piece is crafted in solid bamboo. 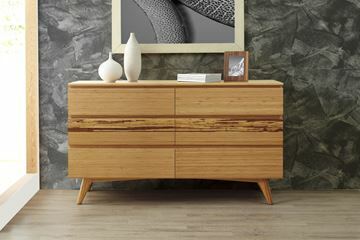 A sleek mid-century design with modern architectural lines, great legs, and a beautiful accent of exotic tiger bamboo. Beautifully finished on all four sides, the Azara sideboard features include angled tapered legs, solid bamboo drawer boxes with English dovetail, recessed drawer pulls, under mount drawer glides, and soft closing doors and drawers. Inside, the three doors open to expose generous storage shelves, while above the three coordinating drawers are each faced in solid exotic Tiger bamboo. The Azara Dining Set in Sable finish, by Greenington. Each piece is crafted in solid bamboo. The Azara dining table features sleek mid-century design with modern architectural lines, great legs, and a center table top accent of exotic tiger bamboo. Beautifully finished on all four sides, the Azara sideboard features include angled tapered legs, solid bamboo drawer boxes with English dovetail, recessed drawer pulls, under mount drawer glides, and soft closing doors and drawers. Inside, the three doors open to expose generous storage shelves, while above the three coordinating drawers are each faced in solid exotic Tiger bamboo. 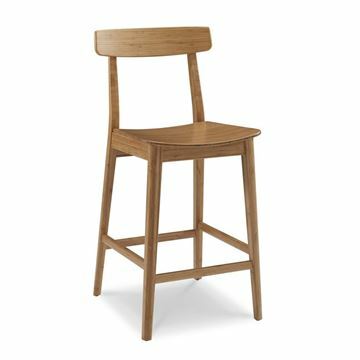 The matching Currant Side Chair is ergonomically shaped for comfort as well as unique design appeal. The Azara Dining Set by Greenington. Each piece is crafted in solid bamboo. The Azara dining table features sleek mid-century design with modern architectural lines, great legs, and a center table top accent of exotic tiger bamboo. 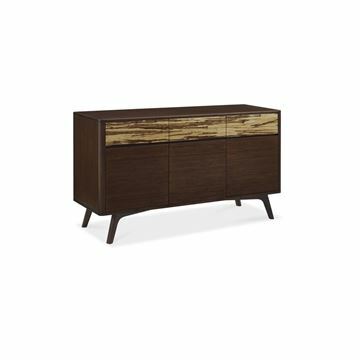 Beautifully finished on all four sides, the Azara sideboard features include angled tapered legs, solid bamboo drawer boxes with English dovetail, recessed drawer pulls, under mount drawer glides, and soft closing doors and drawers. Inside, the three doors open to expose generous storage shelves, while above the three coordinating drawers are each faced in solid exotic Tiger bamboo. The Azara Tall Chest of Drawers in Sable finish, part of the Azara Bedroom Collection by Greenington Fine Bamboo Furniture. The Azara is a beautiful mid-century modern design. The headboard and platform showcase symmetry and really call attention to the bamboo grain. Crafted in 100% kiln dried solid bamboo. Drawer glides are hidden undermount glides, and are soft closing. The Azara Bed in Sable Finish, a part of the Azara Bedroom Collection by Greenington Fine Bamboo Furniture. The Azara is a beautiful mid-century modern design. The headboard and platform showcase symmetry and really call attention to the bamboo grain. Crafted in 100% kiln dried solid bamboo. The Azara Bedroom Collection by Greenington Fine Bamboo Furniture. The Azara is a beautiful mid-century modern design. The headboard and platform showcase symmetry and really call attention to the bamboo grain. Crafted in 100% kiln dried solid bamboo. Drawer glides are hidden undermount glides, and are soft closing. 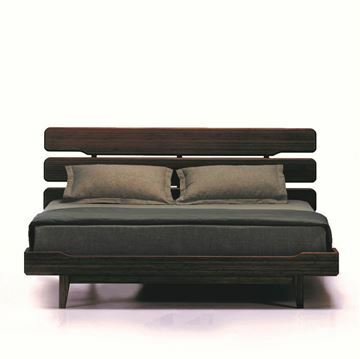 The Azara Bed in Caramelized Finish, part of the Azara Bedroom Collection by Greenington Fine Bamboo Furniture. The Azara is a beautiful mix of modern and mid-century modern design. The headboard and platform showcase symmetry and really call attention to the bamboo grain. Crafted in 100% kiln dried solid bamboo. 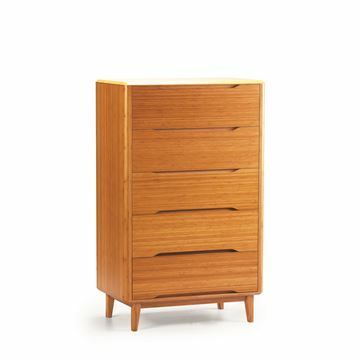 The Azara Tall Chest of Drawers, part of the Azara Caramelized Bedroom Collection by Greenington Fine Bamboo Furniture. The Azara is a beautiful mix of modern and mid-century modern design. Crafted in 100% kiln dried solid bamboo. Drawer glides are hidden undermount glides, and are soft closing. 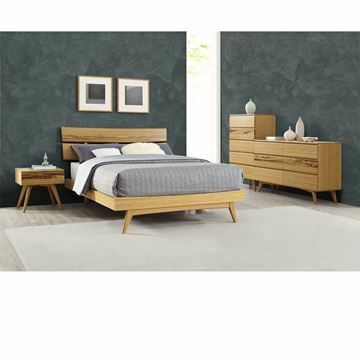 The Azara Bedroom Collection by Greenington Fine Bamboo Furniture. The Azara is a beautiful mix of modern and mid-century modern design. The headboard and platform showcase symmetry and really call attention to the bamboo grain. Crafted in 100% kiln dried solid bamboo. Drawer glides are hidden undermount glides, and are soft closing.